While Amazon customers always had the option to disable Amazon emails, it was a tedious process that required buyers to opt out from each seller individually. Followingly, sellers were able to schedule follow up automated emails, relying on the safe assumption their emails would reach the customer. Can sellers still contact buyers who “opted-out” from Amazon wide emails? What does this mean for sellers using email sequencing? With Amazon’s email opt-out system now bolstered for customers, this is a strong warning against sellers using email sequencing to request for seller feedback, customer reviews, etc. Sellers that continue to push “non-critical” messages to buyers who have opted out from Amazon emails could face a penalty, including suspension of their Seller Central account. Buyers on Amazon have long railed against receiving numerous email follow-ups from sellers, and this growing dissatisfaction has only escalated as more sellers began to leverage email automation software to spam Amazon buyers asking for customer reviews, etc. Fortune covered this in their article ‘Amazon Marketplace Shoppers Slam the Spam’ last year, commenting, “There appears to be no way to opt out of this email flood, which is odd, given Amazon’s self-professed zeal for great customer service.” It’s clear that the growing public awareness surrounding this issue has finally prompted the US e-commerce giant into action. 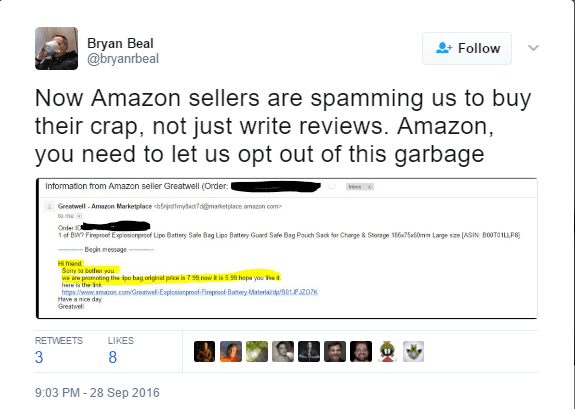 This is similar to the public backlash that propelled Amazon’s incentivized reviews ban in October 2016, where Amazon was forced to take action once the issue began to circulate in the media, as it proved to be extremely damaging for their ‘customer obsessed’ image. In that particular case it was to tackle the growing perception that most of the customer reviews on Amazon were paid for, a PR disaster for Amazon to say the least, with reviewers acknowledging online they were paid to write fake reviews on Amazon. Currently it remains quite complicated for buyers to opt out from Amazon-wide emails, which can only be done via the phone. However now that Amazon have strengthened their opt-out email system, we expect Amazon will make it easier for buyers to disable Amazon-wide emails, perhaps either by adding the functionality online, or providing an ‘unsubscribe’ option in the emails themselves. Consequently we expect the number of sellers hit with this email to increase over the coming months, as more and more buyers choose to opt out.